This is a step-by-step learning and understanding of both the text of the Hadith and the language as well. Explained in a unique way, this book is a springboard for a greater understanding of the context of the Ahadith. ‘Ahaadiith Sahlah: 20 short and easy aHaadiith, selected to teach Qur’aanic Arabic and cultivate Islaamic manners according to the Sunnah. Topics in the narrations include: pillars of Islaam, Iimaan, Salaah, beloved deeds, charitable deeds, the best deed, the worst deed, forbidden deeds, manners of worship, manners of eating, manners of giving salaam. Each Hadiith is explained with simple lexical and grammatical notes followed by easy exercises. 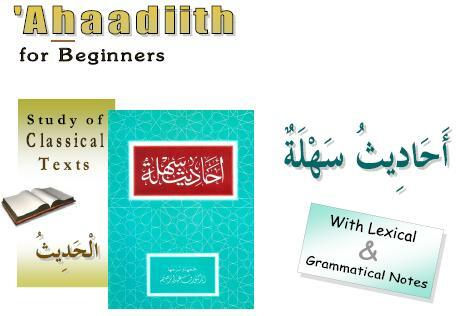 Recommended for beginners, those ready for Arabic-only books, and teaching children.